With all the commuting I take on each day, comfort is key. Knit dresses like this are my favorite to keep around because they merge style, convenience, and versatility all into one easy piece. Is anyone else annoyingly sensitive to most denim and pant fabrics? Winter, I'm not ready for you. With that in mind I tend to layer my dresses and skirts as long as the temperature allows me, with my favorite outerwear being dusters and trench coats. This Shein piece is particularly perfect for the autumn wind while adding some movement to the look as a whole. The result is an outfit that is ready for whatever the day and season may bring. What are some summer pieces you're introducing to fall? Beautiful dress! I love how you paired it. Love the look, Christina! I love the color of your coat and the way it flows. I'm excited to see the looks you come up with for the autumn season! I'm not a pants kind of girl either but it's too cold to wear dresses and skirts all year long heheh. 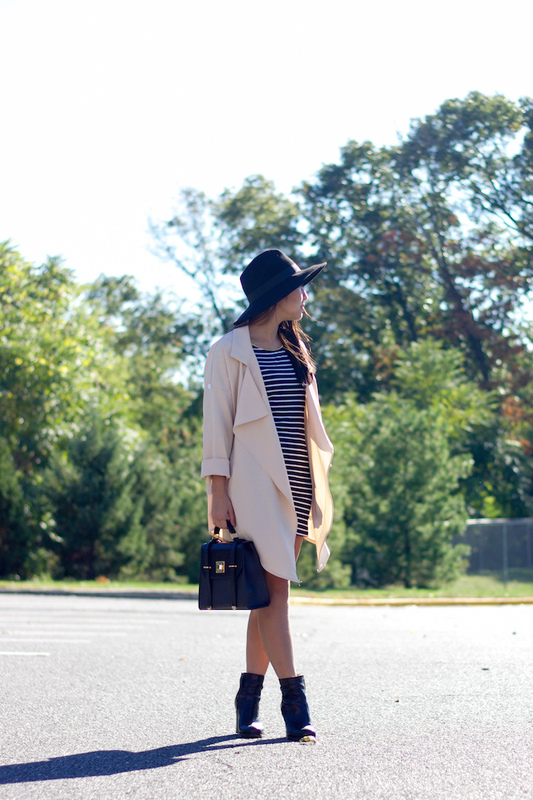 Loving that you're taking advantage of the transitional period and working this dress and waterfall jacket! Such a cute look I love the dress and that jacket so much!! I love everything about this look- from the striped dress all the way to the adorable booties!! Gorgeous dress, and I love how you styled this whole look! Great styling,I always always love how you choose simple pieces and put them together nicely,must be an art,I'm sure you'll be fine wearing pants,xoxo BING. I'm not much of a pants girl either; dresses and skirts do the trick for me. This looks incredibly comfy and chic at the same time. In love with those boots, Christina! Thanks May!! I totally agree, I am going to miss wearing dresses when it really gets cold! Loving this outfit so much - the color combination of black white and blush pink are just perfect as are pairing a classic preppy stripped shirt dress with a loose trench! And I agree, comfort really IS key. Thanks girl :) I can only handle comfortable outfits for the city life! The stripe dress is so amazing and the whole outfit is well put together. Love the dress on its own but the coat is such a great addition! What a beautifully elegant but chic look! Love, love, love this look! Such a classic combo!